This will be the final update for the tank... its been 68 weeks since startup back in August 2013. I plan to re-scape it very soon. I didn't have time to do any plant pruning or maintenance since the previous update (truthfully, i was just being lazy again), so the plants had absolute freedom to grow and take over the tank. Cyperus Helferi grew crazy as expected, quickly covering the water surface and arching over to the other side of the tank... i measured the longest leaves and they were more than 110+ cm in length! Blyxa Japonica also went nuts and ballooned into huge bushes, the cluster on the right has grown tall enough to almost the reach the water surface by a few cm. Eleocharis sp. 'Mini' continued growing even more densely but still retained its compact and short growth height, interestingly even the areas under shade grew well too. I've still not had to trim it ever since tank startup (which was more than a year ago). Its indeed one of the lowest maintenance carpet plants i've ever kept so far. Nice tank! !, was thinking to do something like your tank! Looking forward to your next scape! Sad to see this tank go. Overall it's already a simple layout with few types of plants. I'm curious -- If you are planning for slower growing plants, would you still need to continue with co2 injection? What plants are you thinking? I'm planning to convert the layout into a sand-based tank with mainly branchy wood, sort of a modular layout which i can change around and manage easily. I'm probably looking at various combinations of moss, anubias, bucephalandra etc... basically plants that can be tied to objects. 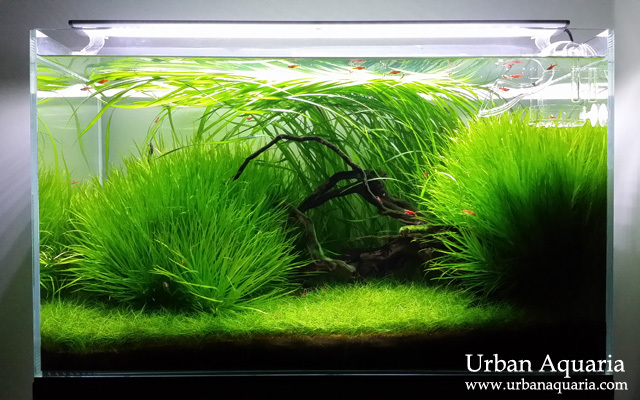 For the Eleocharis sp. 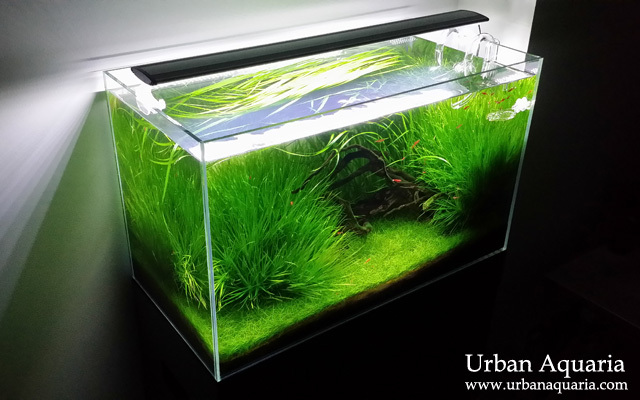 'Mini' species of hairgrass in this tank, i didn't need to trim it at all for more than a year as it naturally has a short and compact growth, so its very easy to manage. Hi, could you let me know how you quarantine all your new plants? Do you have a solution to kill off all the hitchhikers ? Whenever i get new plants, i always wash and rinse them thoroughly in clean running tap water, then put them in a quarantine tank (just a small plastic tank with hang-on filter and LED lights), and then dose the quarantine tank with Easy-Life AlgExit, ISTA Snail Remover and Seachem Paraguard... those treatments combined help eliminate algae, snails (and other hitchhikers) and parasites from the plants. I treat the quarantine tank like a regular planted tank, fertilizers are still dosed and it has a regular light photoperiod. Thanks for your advice. Will try to follow it as much as i can.